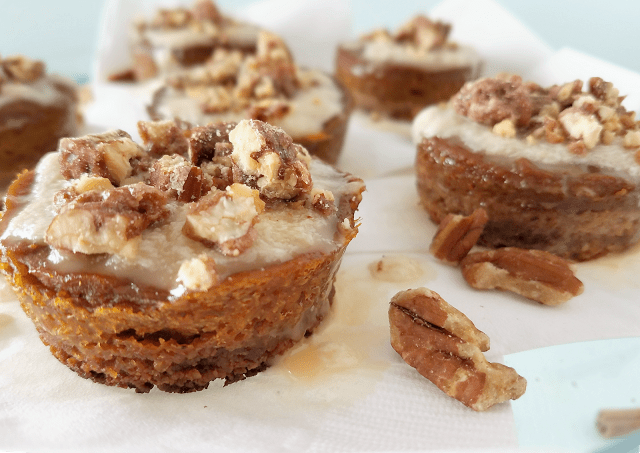 These individual Maple Pecan Pumpkin Pie Tarts are bursting with flavor thanks to the pecan crust, maple glaze and perfectly-spiced pumpkin pie filling! Since they are gluten-free, grain-free, egg-free and dairy-free (vegan), they can be enjoyed by just about all of your guests, even those with food allergies. Get out your muffin pan and give these a try! I love pumpkin pie. Like, really love pumpkin pie. Forget the turkey, pumpkin pie is the Thanksgiving food I look forward to the most! However, it has not always been a love affair with pumpkin pie. When my kids were babies and their sensitive little tummies required me to follow a restrictive diet, I found my beloved pumpkin pie on the chopping block. Gluten-free crust was easy enough, but pumpkin pie is a custard, after all, and I couldn’t eat eggs! I also couldn’t eat dairy while I was nursing, and the thought of pumpkin pie without a huge glob of whipped cream was…upsetting. I might as well skip the pumpkin pie completely! Yet, pumpkin pie is only on the menu (or should I say, accepted as part of the menu) once a year. So what’s a girl to do? Figure out a recipe for an egg-free pumpkin pie with a yummy maple glaze, that’s what a girl should do! And figure it out, I did. These Maple Pecan Pumpkin Pie Tarts take the taste of pumpkin pie to the next level with a maple pecan crust and maple glaze. It’s so good you won’t miss the whipped cream! All that flavor, yet these little bites of flavor are gluten-free, grain-free and vegan, which means they’re egg-free and dairy-free. I did all of that because I know you want to enjoy that beloved pumpkin pie flavor this Thanksgiving! Pumpkin pie is a treat, to be sure. But did you know that there is also a lot of nutrients in it? Pumpkin provides lots of beta carotene per serving, 200% of your daily value, to be exact! When the body turns all that beta carotene into vitamin A, it is used for everything from maintaining eyesight to protecting the skin from UV damage and supporting the immune system. Research shows that a diet rich in beta carotene may even help fight certain forms of cancer.But the benefits of pumpkin don’t stop there. Pumpkin also contains more potassium than a banana and enough fiber to help you feel full (source). 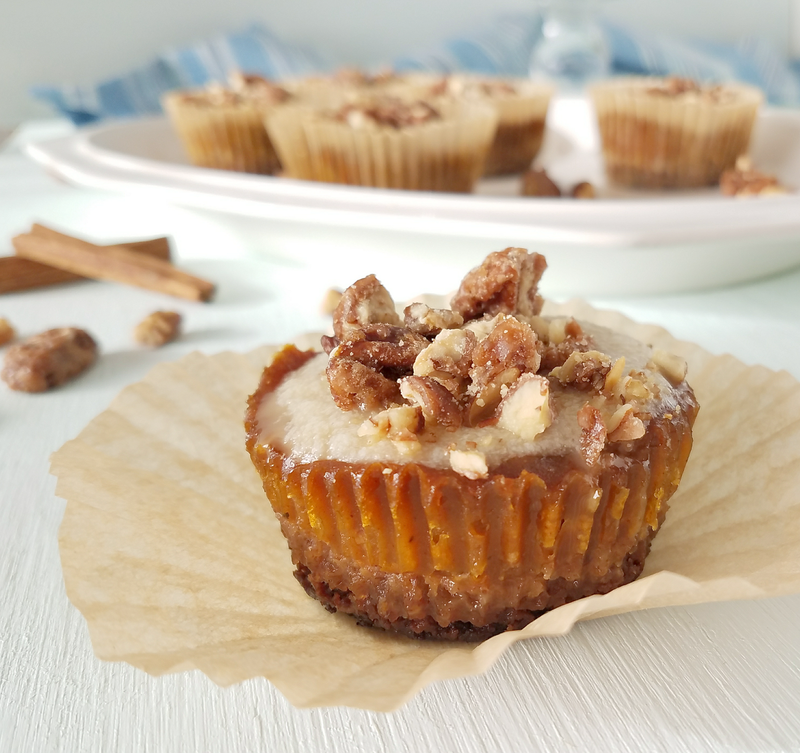 Pecans also contribute to the nutrients in these Maple Pecan Pumpkin Pie Tarts with vitamin E, copper, manganese, and unsaturated fats that help to keep the heart healthy. Pecans also provide powerful antioxidants, especially polyphenols like ellagic acid, which research shows may protect against cancer (source).So even though these Maple Pecan Pumpkin Pie Tarts are a treat meant to be enjoyed at the end of your Thanksgiving feast, they will provide you with plenty of nutrients to help keep you healthy. And, because they’re gluten-free, grain-free, dairy-free and egg-free (vegan), they can even be enjoyed by your guests following special diets! These Maple Pecan Pumpkin Pie Tarts are relatively easy to make, but I’ve included the tips below to make it even easier for you to get these on the table this Thanksgiving! I’ve included Amazon links to products below as part of my tips and tricks. Some of them are affiliate links, which means that I may receive a small commission if you purchase a product through one of my links. Thank you for supporting Taste Abounds! This is going to be disappointing to my Paleo friends and those with corn allergies, but arrowroot is not an acceptable substitute for the cornstarch in this recipe, at least not for the pumpkin pie filling. Gelatin might work, although I admit I haven’t tried it. If you try gelatin and it works for you, be sure to leave a comment about it below! Let’s face it, real maple syrup is expensive! I’ve found Costco to have the best price, by far. Check out my post on 30 Organic Pantry Items to Buy at Costco for more info. If you don’t have a Costco membership, you can snag this maple syrup on Amazon. 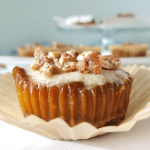 See the beautiful Maple Pecan Pumpkin Pie Tarts in the photo above? They were made without disposable baking cups using a silicone muffin pan. Watch my video below. They just pop right out! And clean up is a piece of cake. Or tart. Whatever. The silicone muffin pan is awesome! Best. $10. Ever. Spent. Find it in one of the links above or in the ad below. I use the Ninja Master Prep I’ve told you about so many times to make this recipe. It’s a blender and food processor both for less than $40 and it is awesome! I have yet to find a task it can’t do. Hopefully the tips above make this recipe easy and affordable. Check out the video below and then keep scrolling to see the full recipe! 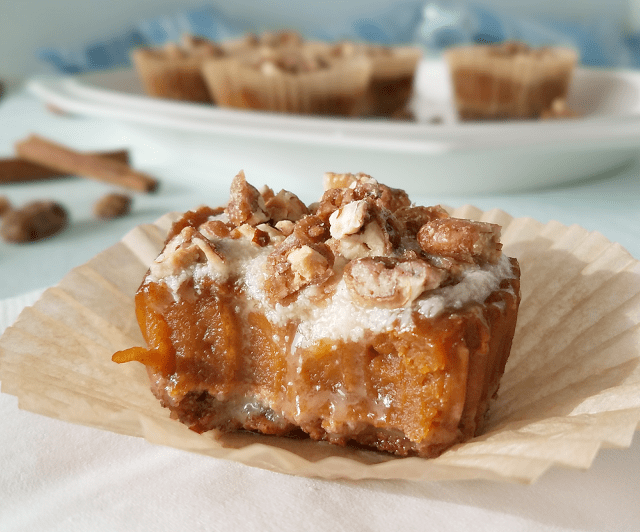 These individual Maple Pecan Pumpkin Pie Tarts are the perfect size for each of your Thanksgiving guests, yet they're bursting with flavor thanks to the pecan crust, maple glaze and perfectly-spiced pumpkin pie filling! Since they are gluten-free, grain-free, egg-free and dairy-free (vegan), they can be enjoyed by just about all of your guests, even those with food allergies. Get out your muffin pan and give these a try! Pulse pecans in a blender or food processor to break them into lentil-sized pieces. Add the maple syrup and melted butter or shortening and blend until the "dough" starts to pull away from the walls and seem like it's going to form a ball. One or two tablespoons of water can be added, if needed to bring the dough together. Spoon about 1/2 tablespoon into each muffin cup. Use an oiled spoon to press and smooth the crust across the bottom. Bake at 425 for 5 minutes. Remove and let cool while you prepare the pumpkin pie filling. Place all ingredients in a blender and blend until smooth. Pour an even amount on each crust (about 3 tablespoons). Level and smooth with the back of a spoon. Remove and let cool for about 30 minutes before adding the maple glaze. Wisk all ingredients together, starting with the cornstarch and melted butter or shortening before adding the maple syrup. Let sit for a minute or two while the glaze thickens. Once the pumpkin pie tarts have cooled, drizzle the glaze over the tarts. 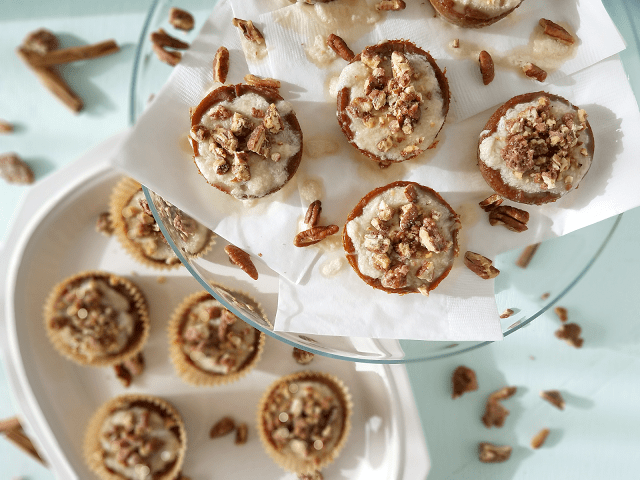 Top with crushed regular or candied pecans, whichever you prefer. Oh the yummy flavors! Total fall and pumpkin perfection, thanks! So fun and such simple ingredients! I can definitely do this! Oh my goodness! Those look amazing. I’d definitely have a hard time eating only one! I always grab two of the maple syrup jugs at Costco – can’t beat that price! Looking forward to making these for my boys. Omg making these this weekend!! I love pecans and pumpkin spice seasoning! Wow, these are gorgeous little treats and no egg is amazing! I’m seriously sitting here drooling! These are so cute and so perfect for the holidays, and I love that pecan crust. Oh my goodnesss, these look so moist and delicious. That color is simply gorgeous! 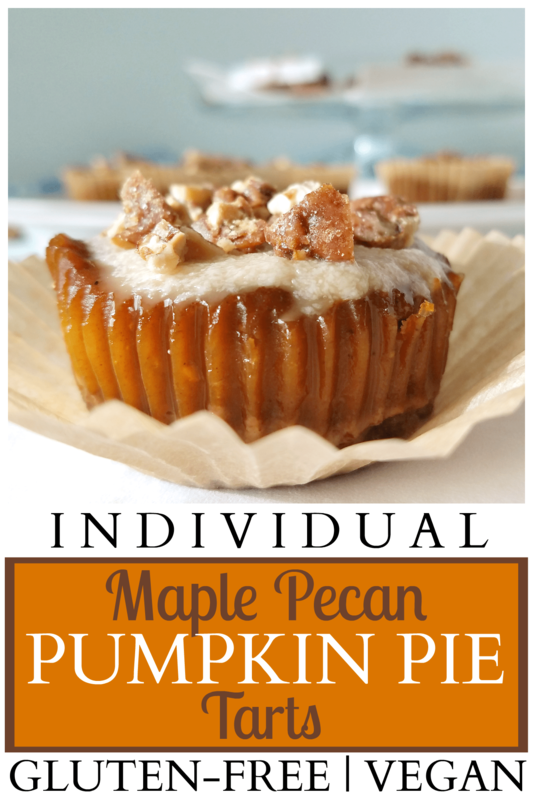 Maple syrup, pumpkin and pecans – so many of my favourite things! These look delicious – thanks for all the tips and tricks! Oh these look so delicious! I love how you packed in all my favorite fall flavors. I can’t look at these pictures without my mouth watering! They look so yummy!! !